My lovely little texas ebony has finally arrived! Im so excited it's about 7 inches tall. I plan on putting it into an old planter i have with a little fishing mud man. Its curving a little at the top, should i be wiring it or anything? (i believe they guy i bought it from said it was 2 yrs old) It seems pretty fragile though i don't know if it could handle that. Anyhow right now I'm just worried about stressing it out transplanting it, I read about how to kind of spread the roots. . I'm really nervous. I killed my last bonsai, so this time I'm trying to do my research. How do i deal with the roots, the soil and watering right after?? Should i wait a little before watering it, wait till its almost dry? I would wait for it to settle in before you do any serous training. This particular tree needs well training soil, and does not like to be over watered. As for the training, you will need to envision what the tree is to look like in the end. 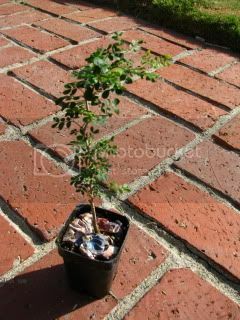 Then, using either clip-and-grow and/or wiring, shape the tree to the desired form. Looks like now you may just want to let it grow before you begin to bonsai it. Thanks, i'll hold off on training for a bit. Any tips on transplanting or type of soil? Half sand, clay . . ? The soil I have been most successful with in the past is a 50 50 combination of screened bark chips and screened clay. You can adjust the amount of either one to make the soil stay moist longer or shorter. Congrats on your Texas Ebony. This is my favorite house bonsai. For now I would let the tree adjust to its new home. While you're waiting select a pot. About 6-7 inches should do fine. Select the soil you want to use. I use 50/50 potting soil and sand. 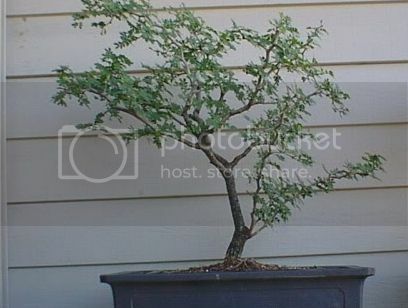 When you repot, remove any rocks or gravel from the top and remove the tree with rootball intact. Place it in the new pot and backfill with soil. Like transplanting a tomato plant. Water well and resume watering when soil in almost dry. Don't be surprised if the leaves fold up for a while. This is normal. I would not attempt pruning or wiring at this time. Let the tree grow. This tree is about 20 inches tall and 21 years old. They really are slow growers.